The Edelwiser ski company is interesting in that they essentially provide a customized graphic line of skis via the Internet. You can download graphic templates for each model, create any design you can think of, then upload the files to Edelwiser where they will produce you skis with your design and color scheme in as little as two hours shop time. Rumor has it they can deliver a pair of customized skis from Austria to the US in 5 days. They have won several awards for mass customization and marketing. You can get points for each pair of skis you get your freinds to buy, while they get a discount when they use you for a reference (the old "turn your freind in for your own discount" routine). They get money off, you get credits toward your next pair...you get the idea. Check out their corporate branding examples and work by many artists. Very cool company with great ideas and impressive skis! Here we go with my Edelwiser Firnis 170 review. I had the possibility to ski the Firnis for several days in Heiligenblut/Carinthia/Austria changing day by day between Swing, Speed and Firnis. 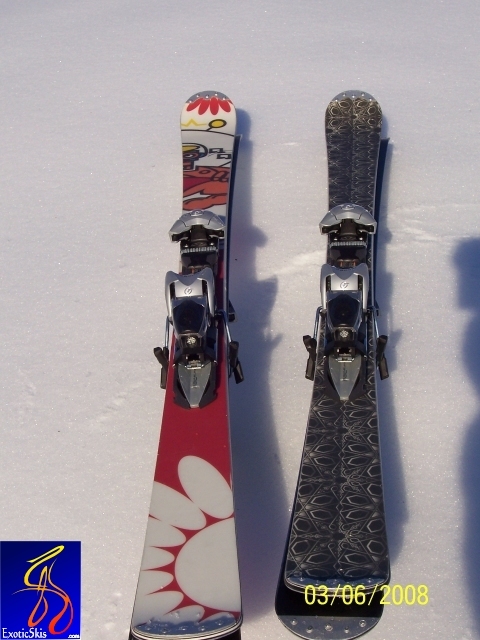 The design with the caps on tip and tail are quite unique and the ski feels solid and heavy even weight is similar to the Swing. With the first turns the ski felt quite "long" despite the lengh of 170cm and I also felt the tail in the turns. Compared to the tail the tip felt very much light and with less power flex than the Swing/Speed. 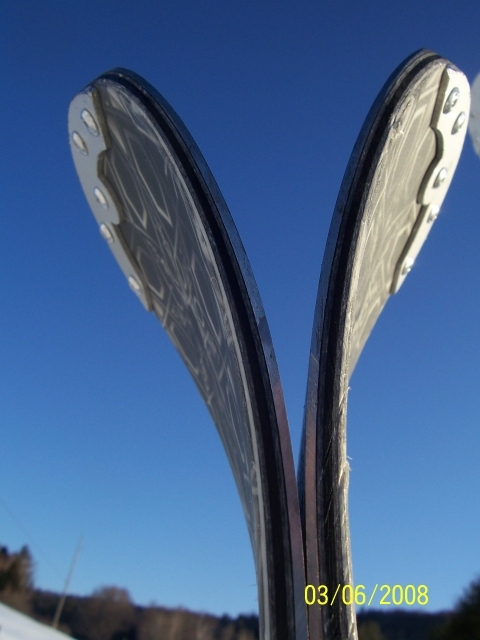 To be exact: The tip feels solid and rebounding half the distance between binding an tip-end. The last 30-40cm are quite soft and much less agressive compared to the other Edelwiser. Despite the first turn impressions the Firnis worked out as an excellent carver with a little less sporty and agressive nature compared to the others. 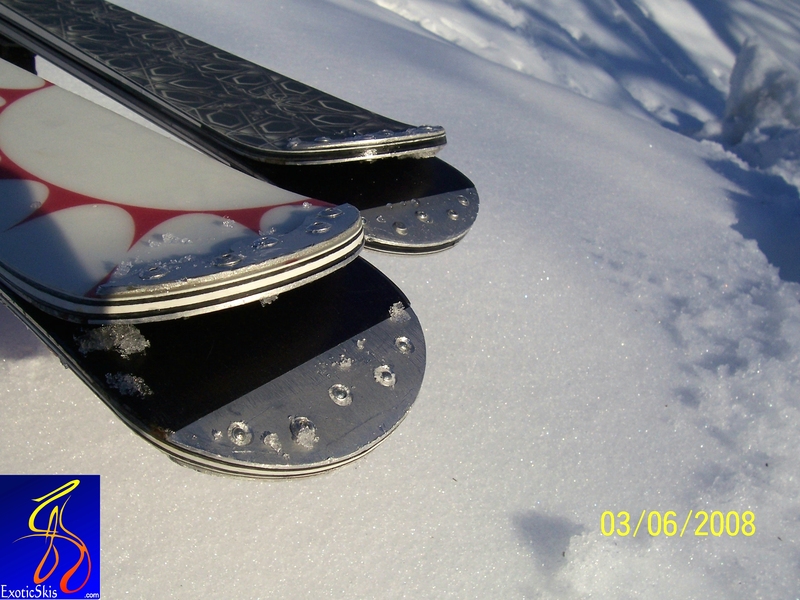 It can be skied also in conservative drift style without any problem and does not force the skier at all. If you push the ski it shows its second face because due to the soft tip construction the Firnis can cut down the radius quite a lot and becomes more agressive and carving-style. The question with the feeling of a long tail was answered by Edelwiser with a binding position more forward compared to Speed/Swing. So I skied and skied on-piste and off-piste and skied and skied....and somehow I had a very much confortable and easy feeling on the Firnis. I needed to adept my style a little. It became smoother and less forced. The Firnis feels like an all mountain glider for every day and all purposes. Very much easy and undercover. Looks good/feels easy. Ice grip is very good despite "no metal in the ski". Off piste performance is also very much easy but all a little more old style. It does not force you to a carving style and does not push you in higher speeds even the ski can be skied in higher speed levels. 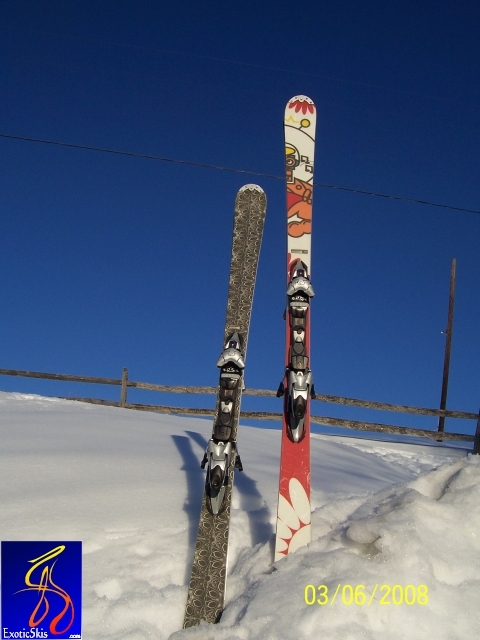 For me the Firnis is an ideal ski for advanced old style skiers who drift a little and carve also with the ambition to change skiing style depending on conditions and power reserves. Whatever snowcondition, on-piste or off, nothing a problem for the Firnis, carve or drift, all ok. Its like your 10years old shepherd dog going with you everywhere. Its alsways with you and will never let you down. I personally prefer the Swing-Speed style of ski. More rebound in the tip. Binding position a little more back to the tail and more agressive carving orientated with similar off-piste abilities. Formal review is coming....until then here are some quick pics of the Edelwiser "Firnis" in 170cm (darker customize topsheet) and the 180cm (white customized topsheet). Firnis model is manufactured in Italy. Upload your own graphics ! Wood core, fiberglass, low-scuff slightly matte finish topsheet (customized). Slightly burly construction, relatively thick tip and tail thickness, stout and responsive flex pattern with excellent torsional rigidity. Good dampening. Nice fit and finish. 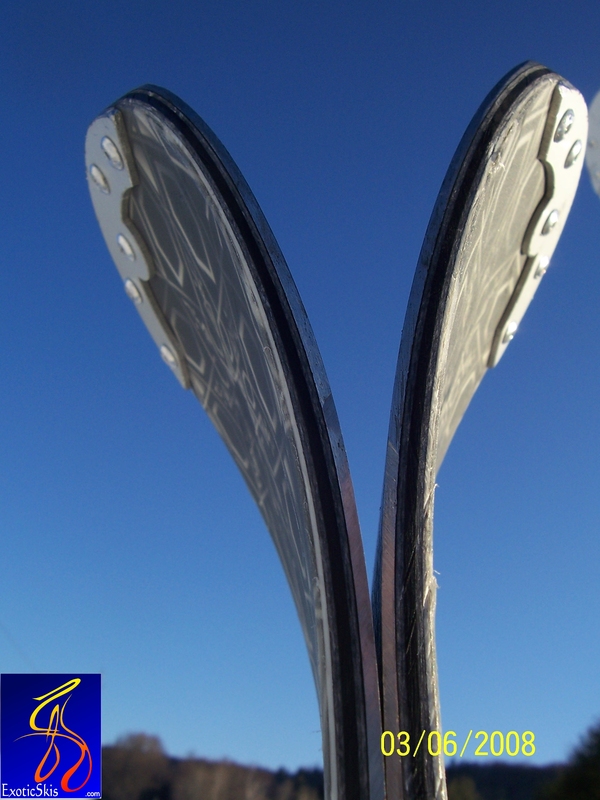 Impressive riveted tip and tail protectors. Looks like the tip will float up nicely. You can get any design you can think of on your own Firnis models...very cool. Cold, dry packed powder conditions, perfect combination of packed groomers and some cut-up fresh stuff (ranging from a few inches to some boot-deep stuff) on the side of some trails. 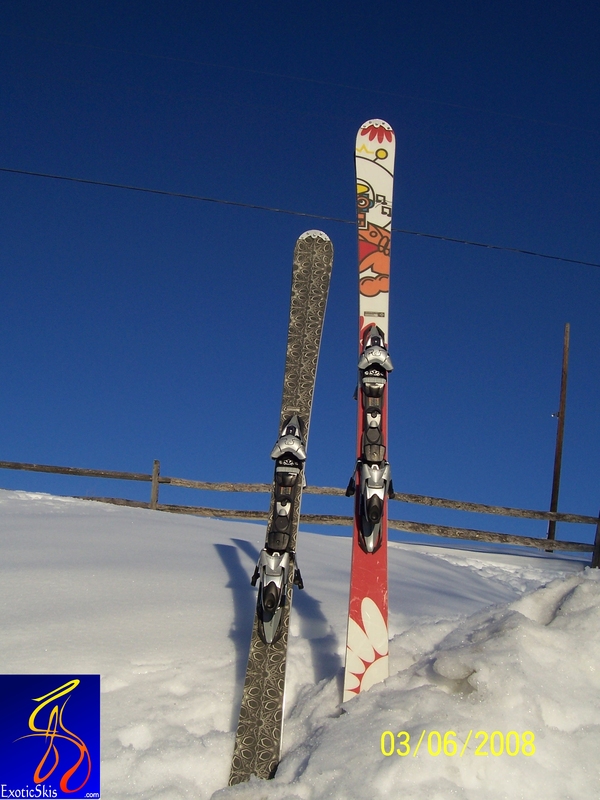 We tested on several days and several ski resorts in Vermont. First impression is the ski is definitely sporty and strong. The turns can be slid or carved. Short radius? Fine. Long radius? Fine. High speed? Fine. Bumps? Fine. Junk snow? Fine. Powdery snow? Fine. The Firnis is one of those rare all-mountain skis that really goes great on almost any surface. The fun thing about the Firnis is it can lay down some serious, hard-core carving trenches when asked. It has a huge reserve of strength and power if you need it. High edge angle or high-pressure radius turns are handled smoothly and precisely. It almost feels like it's an all mountain ski at the tip and tail, and a high-end carving ski underfoot at speed. Very interesting. The only place I found it got less than top marks was making short, slalom-like turns on the hardest Vermont boilerplate. It really wanted to respond best making medium to longer carves across the bulletproof surfaces with a rolled edge introduction rather than a stop-and-chop technique. This is due to its sidecut, I think, and you immediately feel what it wants and it naturally pulls you into it preferred mode across this kind of terrain. As soon as you have just the slightest snow depth to sink the edge into...the Firnis took off and hooked into its turns with zest. Bumps are just fine, but don't expect a soft, fluffy ride and floppy forebody. The Firnis is full of rebound and response and doesn't really "soak up" bumps as much as it rides them and gets pop off them. 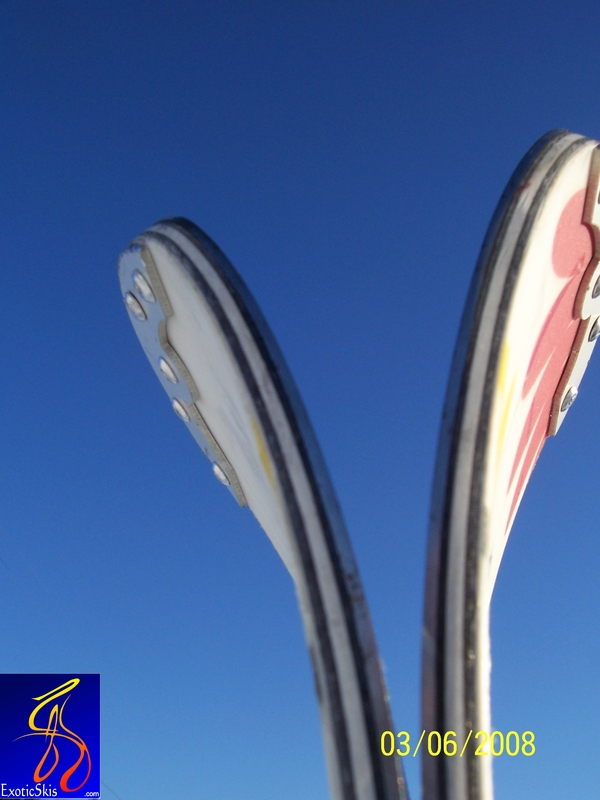 The harder you ski it in the bumps, the better it works. Get lazy in the bumps and the ski will put you in the back seat. I recommend the lighest weight or less muscular skiers demo the Firnis first and see if it's the ski for you. All other skiers will probably find the Firnis really fun. The Firnis is the kind of ski that grows on you after a bunch of runs and I found myself grabbing the Firnis out of the quiver first on several days after the initial testing, then grabbing it for my last runs of the day too. A GNCC / ISDE dirtbike for snow. Fast, powerful, ridable all day and can handle anything in its path with speed and confidence. Easy going between special test sections, and a ripping fun tool in the special tests. A step up from standard showroom models. Get my own pair with cool graphics. The only question is which length...? The "Action" video gives some good footage of identical twin teenagers on the same slope with the Firnis 170 and Firnis 180 so you can see how the skis handle in the open terrain. The interview vids might give you an idea of what they thought of the skis. Question...having skied the Speed and the Firnis, what kind of ski do you prefer? The more carve-style speed or the more smooth Firnis? For me also interesting that the Swing is viewed as a intermediate carver whereas I see the Swing on the same performance level. What speeds are you skiing.....speed of light? I think the Speed is more precise and suited to technical carving, while the Firnis is more all terrain and is not as technical...somewhat more effort is required to carve the Firnis to the same intensity as the Speed. The Speed is not as well suited to bumped up or gnarly terrain as the Firnis. It seems to like the groomed open spaces best, but does perfectly OK in the woodsy trails and bumpier surfaces. The speed has a more quiet manner at higher speeds and is more "racy" than the Firnis. The Firnis feels heavier and more stout and rowdier, wanting to change direction and styles. The Speed feels like a precision instrument and lighter to the touch, with a quiet manner craving speed. I like the Speed more for carving adventures on packed slopes. I like the Firnis more for all-terrain explorations. Maybe I should buy both? My opinion of the Swing is that it is a very high scoring ski for its intended audience of nearly everyone. The Speed gets my high score, but for its intended audience of higher speeds. 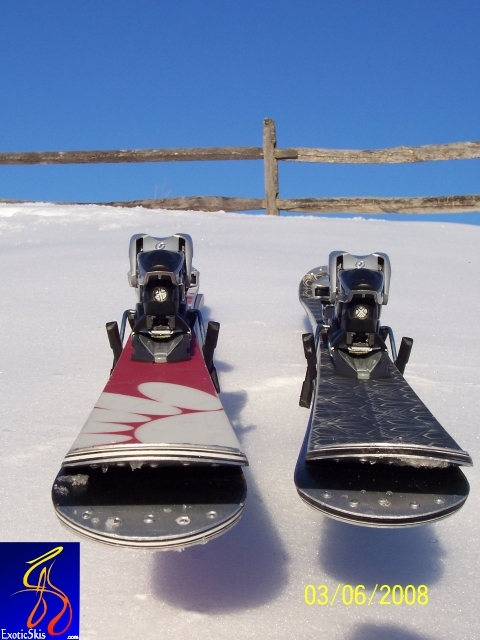 The same score might apply to two different skis according to how well they do the job for the intended skiing category. I think the Swing is excellent up to moderate speeds, then the Speed takes over the high score above those velocities. I do not ski as fast as Max. Not many people here do! I am a humble skier, but I have fun! I started on the 170cm Firnis and again found them to be slightly overwhelmed by the speeds I tend to carry on hill. I'd link a few good turns together then hit a bit of ice and the grip I expected sometimes wasn't there, due I think in some part to the slight tail grab they exhibit. It's subtle but for me was a deciding factor between the Firnis 170 and 172 Speed model a few weeks earlier. And while I didn't have the Speed to compare to on this day, I still prefer it. I think, for a more deliberate skier, the 170 Firnis could be MORE fun than the Speed. Next up was the Firnis 180cm, which I had only taken for a couple on runs in February. This time I gave them more time, and was rewarded with some very enjoyable runs. The 180 handled my speed and, more importantly, held the bite on the icy stuff when it hit. I don't feel the same tail grab as with the 170's so, for me, that's a plus. Turn-wise, I rate the 180 Firnis and 172 Speed very close. I wish I had taken a picture of the twin tracks (slices) my son left in the hill using the 180's this day; I tried to duplicate it but just can't bend my body, or skis, that way. (Actually - you can see him on the same ski in the YouTube Edelwiser clip from last month's demo session...on a different part of the hill). That's what these skis are capable of: anyone from an intermediate through racer can have a lot of fun on the 180cm Firnis. Just an added note on the Swing vs. Speed, I found the Swing to be wonderful at carving, certainly beyond the "intermediate" level. It need not be labeled as such. Better as an "expert, short-length, carver, also quite suitable for all-terrain". I was able to bring the Swing to it's melting point, velocity-wise, and it's not a criticism of the ski at all, since it does everything so well. The Speed absorbed everything I threw at it, so while I am still able to ski fast, it is the one I favor. The only caveat is that I did not try the Speed on loose snow, ungroomed terrain. I sensed it would be fine, like the Swing. but cannot say for sure without testing. Awesome skiing ski. Quick edge to edge with powerful rebounds. Smooth and snappy. Excellent edge hold on groomed hard snow. Excellent stability under foot. As you would expect, this ski is a lot quicker then its 180cm big brother. The 180 has all the same characteristics as its little twin, but just wants to go faster and faster and draw out that longer radius turn. Super stable at high speeds with excellent edge hold,and really smooth transitions. Both skis inspire confidence and just want to carve. I wish we would have a big dump so I could take the 180's out. Both like it fast and furious! Its funny both sizes have been out on the hill more than in. One of my compatriots says its the best ski he's been on. The other compatriot is amazed by how they ski. He is still trying to figure out how to use this website because he wants to write a glowing review! Hopefully he will figure it out soon.There may be a problem getting both pairs back from them.... There may be a hostage situation with the 170's. They are just the most fun and positve feeling skis to come down the pike in a while. No one wants to bring them back. I hope we see the demos again. 1.May.2008 Tuxer Ferner/Tyrol/Austria: -10°C on 3.250m, heavy snow and no sight, sun from midday onwards. After little lunch I took the 180 Firnis and all my former test informations were for nothing. The big Firnis took my on a perfect ride through rough slope conditions with 20-30cm powder on and then we had a wonderful powder experiance the whole afternoon. What the Firnis is less agressive (compared to the Speed line) on slope it gives you all back on rough conditions. Superb stability in deeper snow gave me a lot of confidence. I needed quite a lot of speed (or I pushed hard..) but the ski was very much easy to swing and carve in deeper snow. Even in wet deep snow the Firnis was a perfect companion. At the end of the day I thought woow ! this one will be my next ski......ok before I took the 182gun. I personally would prefer the 180 compared to the 170. The 170 might be a little easier to handle if you want fun skiing but the 180 takes it all with the stability and smoothness if you ski with speed. Perfect ski for changing conditions.